Olive Pink Collection. Pencil drawing on card with small water colour attached. Painted and sketched by Olive Pink at the Finke 31/8/30. 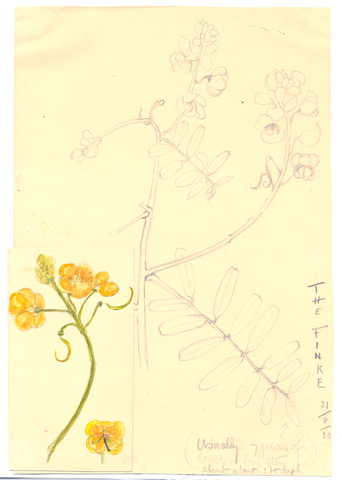 Identified by Olive Pink as Cassia sturtii "usually 7 pairs of leaves on leaf stem - shrub about 3ft high"
Pink, Olive 1930 , Olive Pink Collection. Pencil drawing on card with small water colour attached. Painted and sketched by Olive Pink at the Finke 31/8/30. Identified by Olive Pink as Cassia sturtii "usually 7 pairs of leaves on leaf stem - shrub about 3ft high" , University of Tasmania Library, Special & Rare Materials Collections, Hobart.